This Teen Mom Star's Kid Already Wants To Date! Teen moms join the show obviously when they are in their teen, and the show manages to depict their everyday struggles and life. Some of who's kids are almost going to be teenager themselves. This Teen Mom's daughter already wants to have a boyfriend. To find out who she is continue reading! She made her television debut, by staring in season two of the MTV television show, 16 And Pregnant. After her season ended, the show went on to make 3 more seasons, all with different girls. She was later offered another television role on the show Teen Mom 2. She gave birth five weeks early to her daughter, Aubree Skyee Lind, on September 7, 2009. Sadly, Aubree had to remain in the hospital for almost two weeks due to her being so tiny. Aubree fell sick with what is called RSV, or Respiratory Syncytial Virus. RSV is a common virus that can cause respiratory infections in infants. After her fight with her baby daddy Adam, she filed to get Aubree’s name changed from Lind to Houska. However, she would actually later go on to change it back. 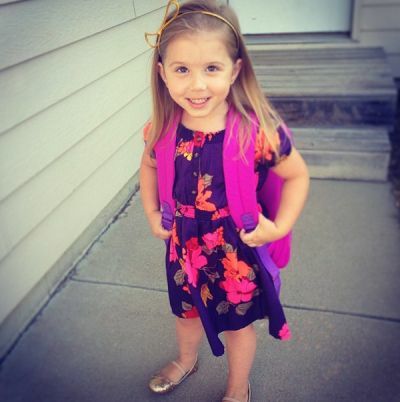 Chelsea might have made a mistake with her ex-boyfriend Adam, but that mistake led to the greatest thing that could have ever happened to her, Aubree. But she found a father figure in Cole DeBoer. When it comes to engagements, Cole really knows how to blow all other men out of the water. He made sure to include Aubree in the proposal. She was in attendance as Cole got down on one knee to propose to Chelsea, and then he proposed to Aubree. Aubree isn’t the only one anymore, Chelsea happily gave birth to her first child with Cole, on January 25, 2017. They named him Watson Cole DeBoer, she is officially pregnant with baby number 3! She officially announced in March that she is expecting her second child with husband Cole DeBoer, and it is a baby girl. In a sneak peek clip for Monday, February 4th’s episode of Teen Mom 2, Chelsea talks to Aubree about boys! The very pregnant reality star is left in shock after the 9-year-old dropped a major bombshell on her about when she can have a boyfriend.